Creek Cottage01263 768440work Self-cateringCreek Cottage is a luxury, spacious, detached flint cottage with stunning views over the marsh and bird reserve of Cley and Salthouse, a mecca for bird watchers. Just 5 minutes’ walk to the village pub and famous Cookie’s seafood restaurant and, with wonderful walks on your doorstep, including Blakeney Point nature reserve. A spacious kitchen and dining room, large comfy sitting room, and a south facing patio and private garden. 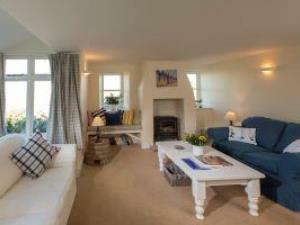 Three double, two with en-suite shower rooms, two single bedrooms and a family bathroom. Creek Cottage is a luxury, spacious, detached flint cottage with stunning views over the marsh and bird reserve of Cley and Salthouse, a mecca for bird watchers. Just 5 minutes’ walk to the village pub and famous Cookie’s seafood restaurant and, with wonderful walks on your doorstep, including Blakeney Point nature reserve.